Arasan Chip Systems, Inc. the leader in MIPI Camera and Imaging IP announces support for the latest version of CSI-2 v.1.3 and the first combination C-PHY + D-PHY supporting up to 17Gbps bandwidth. “Our combination C-PHY / D-PHY physical interface gives applicaiton processor developers flexibility to support evolving MIPI standards for camera sensor and display interface” said Prakash Kamath, CTO at Arasan. Arasan, a leading provider of IP for semiconductor design and manufacturing announces complete support for MIPI CSI-2 v1.3 with extended lane support and the industry’s first combination C-PHY + D-PHY physical interface. 4K cameras are expanding as sub $500 models have been introduced for Sports Action. Drones, IP Suerveilance, and Prosumer markets will drive expansion of features and performance. Arasan's Total CSI v1.3 IP solution comprised of both transmitter and receiver digital controllers, and the C-PHY-D-PHY combination analog interface, provides advanced sensor performance, e.g. UHD (3840x2160) at 60fps, WQHD (2560 x 1440) at 120fps and HD (1920x1080) at 240fps. CPHY achieves high bandwidth through a unique encoding where 16 bits of input data is encoded into 7 symbols and each symbol is transmitted over a 3 Phase encoded line. CPHY reuses the similar low-power signaling as the DPHY. CPHY is designed such a way that it can co-exist sharing the same lines as DPHY. Arasan’s CPHY/DPHY combination universal PHY which can be configured both as Transmitter and Receiver. Arasan’s novel and innovative design techniques allowed sharing a number of modules between the CPHY and DPHY with no impact on performance resulting in optimal area and power. It can work with both old DPHY systems and new C-PHY systems. 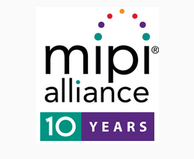 Arasan has been a contributing member of MIPI for over ten years with a long history of customer engagements in MIPI camera and imaging. Arasan works closes with the MIPI Camera working group that includes leading camera sensor suppliers as well as application processor developers. The Total MIPI CSI v1.3 IP Solution includes CSI-2 v1.3 transmitter and receiver controllers and the C-PHY / D-PHY combination physica interface. The Total CSI v1.2 IP Solution for D-PHY is also available. Arasan’s D-PHY has been ported to a wide range of foundries and process nodes from 180nm to 28nm. Please contact Sales for additional information. Unlike many other IP providers, Arasan’s Total IP Solution encompasses all aspects of IP development and integration, including analog and digital cores, hardware development kits, protocol analyzers, validation IP and software stacks and drivers and optional architecture consulting and customization services. Based in San Jose, CA, USA, Arasan Chip Systems has a 20 year track record of IP and IP standards development leadership. MIPI® CSI-2, DSI, C-PHY and D-PHY are trademarks, servicemarks, registered trademarks, and/or registered servicemarks owned by MIPI Alliance. All other trademarks, servicemarks, registered trademarks, and registered service marks are the property of their respective owners.